The selection of clusters to be supported has to be made according to specific and agreed upon criteria. Such criteria should be determined in a transparent process and the ranking be established by the implementing agency, the national counterpart agency and any other bodies that have a clear stake in the initiative. The Cluster Development Agent (CDA) is a neutral professional or broker who facilitates the process of cluster and network development. S/he plays a crucial, yet typically temporary role in developing a sustainable cluster governance system and accompanies the cluster development initiative over the subsequent development phases. A cluster diagnostic study or assessment forms the basis of developing a strategic vision and action plan for the cluster. 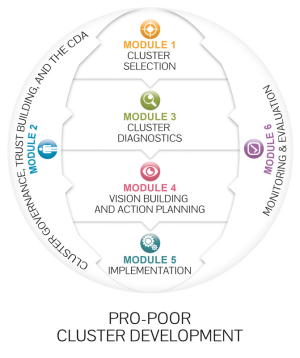 It is developed through a participatory exercise guided by the CDA with a view to: (-) developing an understanding of the socioeconomic and institutional environment of a cluster, (-) detecting potential leverage points for the intervention, (-) providing a baseline for monitoring and evaluation, and (-) building initial trust between the CDA and the cluster stakeholders. Based on the diagnostic study, the cluster stakeholders develop a long-term vision for the cluster for the immediate future and develop a detailed plan for joint actions that are aimed at realizing the cluster vision over specified periods (short, medium, long term). Implementation refers to the entire set of joint actions that are required to realize the long-term vision of the cluster. It is not the mandate of the implementing agency or, more specifically of the CDA, to directly carry out all project activities. Rather, the CDA facilitates the undertaking of activities through the establishment of partnerships with both private organizations and other public institutions and, of course, based on the capabilities (present and future) of the cluster firms. 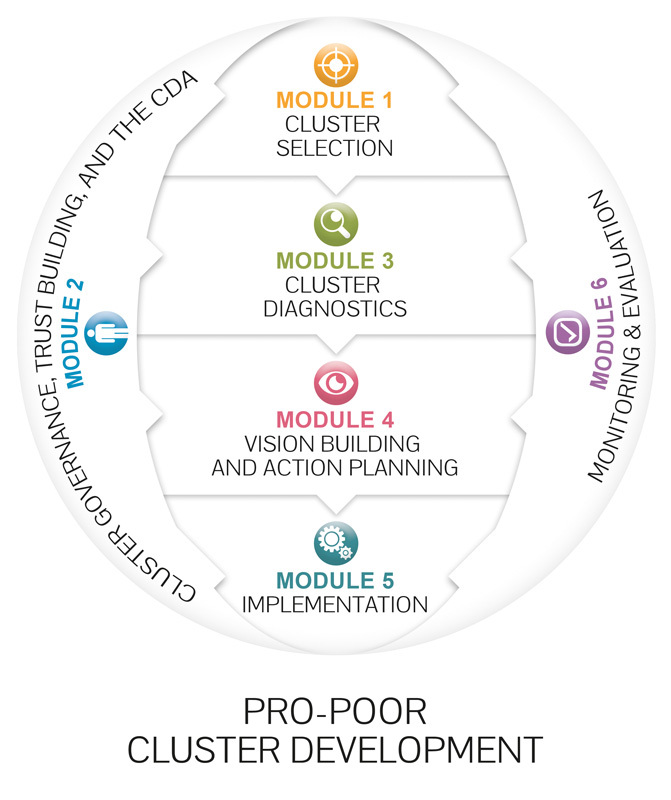 While the M&E phase is the final one in the UNIDO cluster development methodology, M&E activities have to start at the very outset of the intervention. Importantly, indicators against which progress can be measured and reporting lines and responsibilities have to be determined already during the very early stages of a cluster and network development initiative. As already mentioned, the diagnostic phase will usually help with the development of a monitoring framework, the specification of indicators and the establishment of a baseline. At the same time, the vision building and action planning phase will have to be considered to clearly reflect the strategic orientation of the initiative in the monitoring framework. During the implementation phase, M&E activities are performed regularly to assess progress and to undertake corrective action, where necessary.